According to General Mills, Bisquick was invented in 1930 after one of their top sales executives met an innovative train dining car chef on a business trip. After the sales executive complimented the chef on his deliciously fresh biscuits, the dining car chef shared that he used a pre-mixed biscuit batter he created consisting of lard, flour, baking powder and salt. The chef then stored his pre-mixed biscuit batter on ice in his kitchen ahead of time, enabling him to be able to bake fresh biscuits quickly on the train every day. When the sales exec returned home, he used the chef's idea to invent Bisquick. 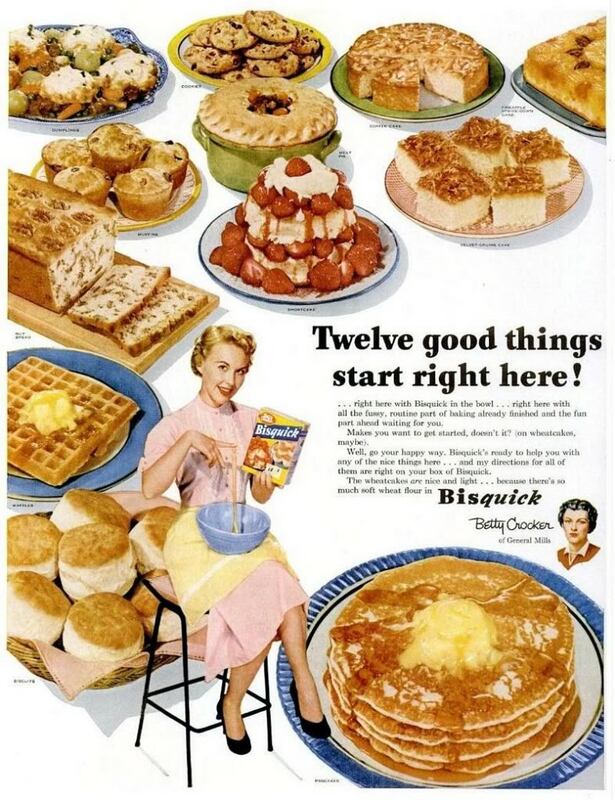 Bisquick has been available in grocery stores since 1931. Bisquick slogans: "A World of Baking in a Box" (1940s); a "12-in-1 Mix" (the 1950s). Wow- "Science's most thrilling food invention"! Who knew? When I got to this recipe, I knew I had to try it. With spring right around the corner, I am so very ready for all things citrus. Orange Pecan Bread has a bright, fresh flavor, and it's the color of sunshine! Sweet, without being overwhelmingly so, and it's moist and tender, even the next day. Preheat oven to 350 degrees. Grease a 9 X 5 loaf pan. Mix all ingredients except pecans. Beat vigorously 30 seconds. Stir in pecans. Bake 45 to 50 minutes, or until toothpick inserted in middle comes out clean. Cool completely before slicing. So moist, and it's a beautiful color. Can you see the little flecks of orange zest? I served this bread with Cranberry Pecan Chicken Salad. The flavors were delicious together! May have been shared with these fun parties! My husband is a fan oranges and pecans...will have to make this for him. Love the simplistic of the recipe! My S.I.L. makes mini orange cupcakes at Christmas, which I love. I'm definitely trying this! thanks for sharing! Orange is such a wonderful flavor and paired with pecans looks delicious in your bread. The texture is perfect and it looks very moist. Hope you are having a great Valentine Weekend and thank you so much for sharing with Full Plate Thursday. Delicious! Love all the old advertisements also! Thank you for sharing with Foodie Friends Friday. Can't wait to see what you bring this week! Thanks, Lois! I loved the old ads, too- I thought they were fun. Wow this looks absolutely amazing! Reminds me of my great Grandmother :) Pinning too.. thanks for the great recipe! I love Bisquick, and it was really interesting to read the history behind it. I tend to make tea biscuits with it, but your Orange Pecan bread is a much more delicious way to use it! I look forward to giving this quick, easy, and very pretty quick bread a try. I love old cookbooks too! I am making a pie for my husband for his birthday and found the recipe in a cookbook my grandmother got when she was first married. Thanks for sharing with us over at Real Housemoms for Fabulous Fridays. Isn’t that fun? I’d really love to hear about it! 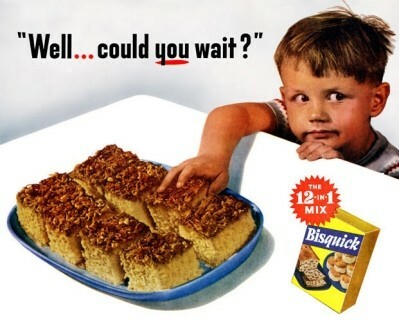 I grew up with Bisquick in the house and always have a box of it in my pantry. I will have to give this a try! Forgive me for being so late in thanking you for linking up to the In and Out of the Kitchen party! I just got back from vacation and am trying to play catch up! See you next week at the In and Out of the Kitchen party! Ruthie, I love stories! :) I enjoyed Super Saturday Show and Tell- I'll see you next week!! :) Thank you for stopping by! It looks delicious! I love orange flavored dishes so this sounds so yummy. I love the idea of cooking old recipes! My grandma recently let me look through her recipe box and there were some real treasures in there. Tammy, how wonderful that you got a peek inside your Grandma's recipe box! Priceless! :) Thank you so much for visiting! That looks really yummy; I love orange flavored treats. And it's so fun to go back through cookbooks and recipes from the past. Love the history behind Bisquick. I so would love a slice right now. Thanks for sharing on Thursdays Treasures. Hi, Mary! How funny- that was one of the very first things I thought about when I researched the history- wonder if the chef got anything out of this?? :) I couldn't find anything that said one way or the other. Lynn, I LOVE that your mom was the Queen of Bisquick!! LOL! Yes, I have made a couple of “Impossible Pies” myself. This bread looks amazing! Definitely must try! Thanks for sharing- and I love, love all the pictures- so fun! Joy, I love this recipe. It's so EASY, which is my favorite type of recipe and the flavors can't be beat. Thanks for sharing this on FFF Nutty party this week. I'm sharing this on my FB page and pinning. And I will be making this bread on Sunday for our week's Sweet Treat.